As an event planner I am always on the lookout for local events that I can develop a partnership with that already has a good following in the community. Well, one of those events is with the Food Trucks. You would have to be a hermit not to know that the food truck movement has taken off around the country. There is even a cable tv show now hosted by Tyler Florence called The Great Food Truck Race. I love the idea of having a mobile event business. It can be very expensive to get started with a mobile business but anyone can bring a table, chair and tent for around $100.00 and become a vendor at any outdoor event. So, just how do you go about developing a partnership with the food trucks in your area? You might want to first visit one of their events and see how many people show up each time. If you see there is a good following the next move is to find out who the event company is.... just look up the name of the local food truck vendors in your town and give them a call and ask them if you can join their next event. They either say Yes! or No! and if they say Yes! it could be the beginning of a great partnership for both of you. Everyone loves going to outdoor events where their is a variety of vendors to see, not just food. So, I came up with the idea that they needed to have some local artisan and direct sales reps added in the event to make it a really fun time. You can shop with the different vendors with Markets of Sunshine and also visit the food trucks and grab a unique taco or cupcake and wash it all down with some really good beverage options. What more could you ask for on a Sunday evening! Success at the Aging Tree event! 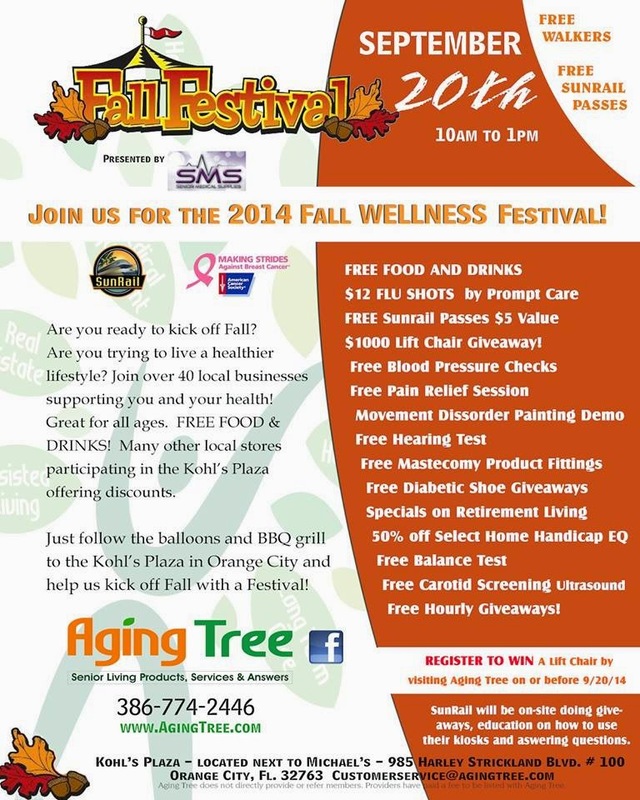 If you missed the event with us on September 20th at the Aging Tree don't worry. Our next event is coming up on October 5, 2014 in the Marketplace Plaza in Orange City, FL. It is in the same plaza as Debbie's Health Food and the Hospice Retail shop. We've teamed up with our local food truck vendor, The Daily City. Join us for food and shopping fun as we join the Food Trucks event from 5 to 8 p.m. rain or shine! We'll have 5 vendors in direct sales and handmade gifts set up along with the food trucks. Sign-up for our newsletter or get on our mailing list and you'll get a goody bag filled with samples from our vendors! and more will be joining us! If you enjoy health and wellness fall festival vendor events, then you will want to join Markets of Sunshine for our next event on September 20, 2014 in Orange City, FL. We will be at the Aging Tree behind Kohl's department store from 10 a.m. to 1 p.m. We will be giving away free samples from our sponsors, Avon, Blooming Tails Dog Duds,Make Time For Kids and Lyme Awareness Information, to those who sign-up for our newsletter or get on our mailing list. us from 10 a.m. to 1 p.m.
from our vendors at the event!